Daryl Stephen Christiansen of Fairport, NY on November 20, 2018 at age 60. He is survived by his loving wife of 36 years Marybeth; 2 children, Maggie ( Jeremiah ) Hamell and Brady Christiansen; loving grandfather to Olivia and William; son to Pauline Christiansen; son-in-law to Lorraine Brady; brother to Dennis ( Judith ), Terry ( Geoffrey ), Richard ( Pamela ), Gregg Christiansen and Kirsten ( Christopher ) Palmeri; brother-in-law to, Kathy, Patricia, Geralynn, Kristine and Joanna; also nieces 'nephews and many close friends. 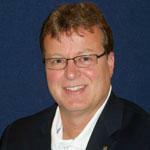 Daryl was CFO of Parrone Engineering and a member of the Fairport Rotary Club. Friends may call on Tuesday November 27, 2018 from 3:00 - 6:00 PM at David A. Doser Funeral Home & Cremation Service, 76 South Main Street, Fairport, NY. On Wednesday morning November 28, 2018 please meet his family at 11:00 AM in All Seasons Chapel at White Haven Memorial Park for Daryl's Funeral Service. In lieu of flowers memorials may be made to a charity of your choice.